KANSAS CITY, Mo. 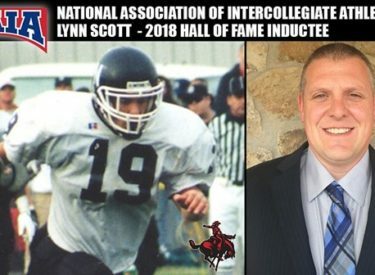 – Nearly two decades after the Northwestern Oklahoma State University football team won the 1999 National Association of Intercollegiate Athletics (NAIA) National Championship, members of the team continue to be recognized for their successes, including Lynn Scott. On Monday, the NAIA announced Scott will be a part of the 2018 NAIA Hall of Fame class, with the induction ceremony set to take place at the 2019 American Football Coaches Association Convention in San Antonio in January. “It’s a great honor for me and the University and I have a lot of people to thank along the way,” Scott said upon word of the accolade. “From all my teammates to coaches like Tim Albin, Garin Higgins, Troy Haub, Dr. Chandler Mead and Fred Slaughter. A native of Turpin, Oklahoma, Scott was a three-time NAIA All-American (1998-2000) during his time at Northwestern, helping the Rangers to the National Championship during an undefeated 1999 season and a return appearance to the championship game in 2000. He also was named named the Central States Football League Defensive Player of the Year in his senior season. A key member of the dominant “Black Cloud” defense during the championship era, Scott compiled an outstanding 298 tackles and pulled in eight career interceptions. He also was a key component in the Ranger return game as he recorded a school record 1,337 career punt return yards. “Lynn Scott was a true Ranger and was a special student-athlete during his time at Northwestern,” said Brad Franz, Director of Athletics at Northwestern. “He was a fiery competitor on the field who led the Rangers to a national title as a stellar defensive back and special teams player. He was well thought of by his peers as a student and athlete. Upon completion of his career at Northwestern, Scott went on to play five seasons for the Dallas Cowboys where he saw time in 66 games as a safety and on special teams before his career was halted by injury. In 2004, Scott started nine games with 33 tackles and his first career interception against the Washington Redskins. Former Ranger teammate during the 2000 season, Patrick Crayton, also hauled in his first career touchdown catch in the same game. Scott also is a member of the Northwestern Sports Hall of Fame, inducted in 2012, while the 1999 National Championship Team was inducted in 2009.